I learned something new today. Actually, I learned lots of new things today. 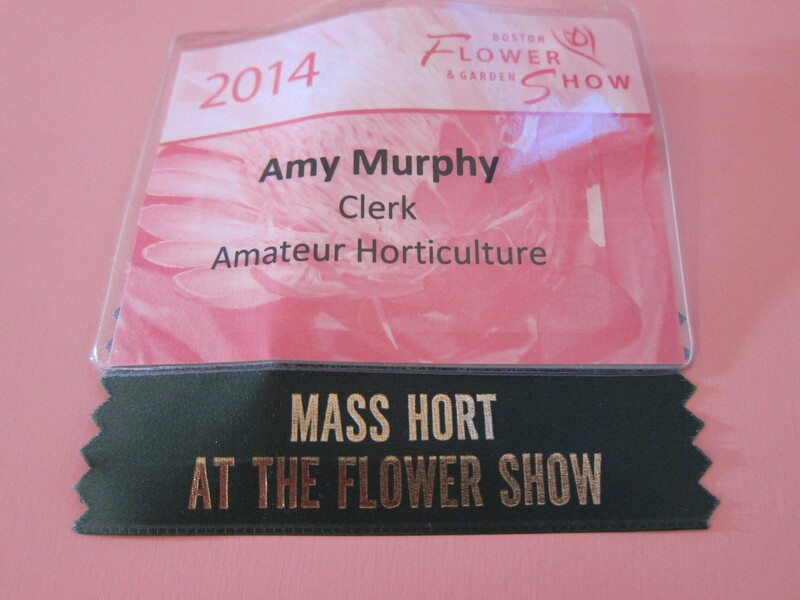 I was a clerk, 2nd clerk to be exact, at the Boston Flower Show assigned to assist several of the judges in the Amateur Horticulture Category. I was instructed first and foremost to keep my opinions and comments to myself, which required a great deal of self control. Beside this, I was to make myself as helpful as possible by locating the plants which needed judging, running to ask any necessary questions, stapling the right ribbon on the right plant, and throwing away empty water bottles. It’s not in my DNA to be a fly on the wall. Nevertheless after today I highly recommend standing silently behind experts as they appraise what they know best. It was fascinating, illuminating, humbling, educational and fun, not to mention a real lesson in cooperative management. Although organized by professionals, The Boston Flower Show is run by volunteers. 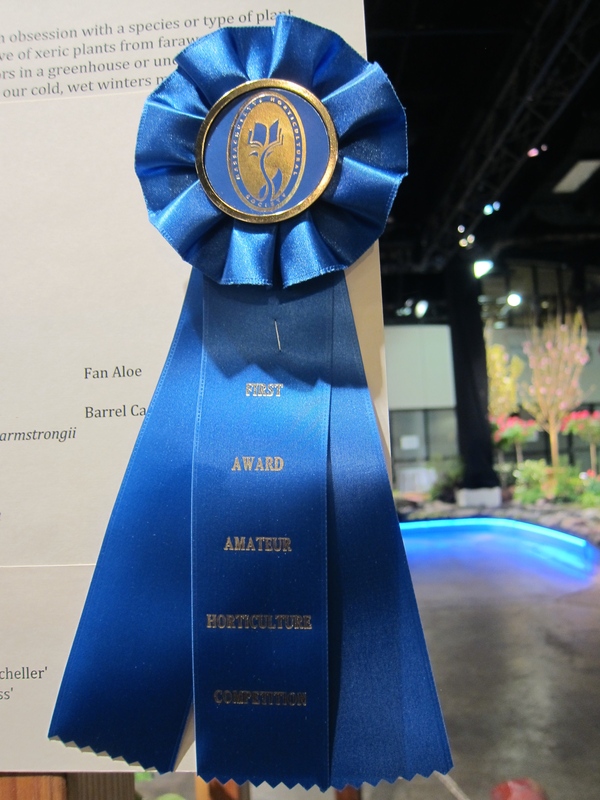 I have been attending the Flower Show for more than a decade, and have volunteered before wearing my Master Gardener hat, but I have to say, even though I have joined the ranks, I am constantly amazed by the knowledge and dedication of the volunteers who year after year keep the Flower Show running. I commend each and every one of my fellow volunteers, including those volunteers who participate by entering a plant, flower arrangement, photograph or floral display. The Show has gone through a few metamorphoses in the past decade. It is not as it was in its prime. It is held in a smaller location with fewer participants ( although the number of people who visit remains high). Nonetheless, the zeal and enthusiasm of those who do participate is unaltered. fun stuff, but “leave my opinions to myself ” would be the end of it for me lol. It is cool how it all comes together, and I am also reminded every time I am there how little I know about something I think I know a lot about! Yes, there is nothing like spending time with a real expert to remind one of how little one knows. It would be hard to stay mute when the judges are making their determinations. As a MG, I got to judge one time and it was difficult, yet fun at the same time. Interesting to hear that you found judging to be fun. As I clerked, I found myself wondering if judging would be fun, and I thought, as you did, that it would be fun but difficult. As a MG myself it could be in my future, we’ll see what the future brings. I would love to be a fly on the wall and listen. I find I learn more when I can be quiet and listen more…what a great experience Amy! Thanks, I hope you get the chance to do it!